I just got back from a three week trip to Southeast Asia. I visited Thailand, Cambodia, and even had time for a one night layover in Dubai. I came back with a ton of photos and decided to take the opportunity to refresh my long ignored website. View the full gallery here. I went on more guided tours during this trip thanks to my travel companion who planned most of our itinerary. We visited several historic temples throughout Thailand, and Cambodia, national parks, floating markets, and an elephant conservatory. Coming into the trip, I knew very little about either country, and while Thailand and Cambodia appear very similar at first, I'm happy to say that I came away knowing much more about the two than I ever thought I would. Thailand is arguably the richer of the two countries. And while we didn't spend a lot of time in Cambodian cities, Bangkok was almost as fully developed as any other city I've ever been to. Thanks to the favorable currency exchange, our USD allowed us to travel in relative luxury. Food and lodging were generally cheaper, and significantly so. Food (and amazing food at that) could be had for as little as a dollar. A ride on their elevated train was roughly fifty cents. Beers were anywhere from fifty cents to three dollars depending on how big of a bottle you wanted. There are exceptions of course, cocktails at Bangkok's Sky Bar (made popular by the movie Hangover 2) will set you back about ~$15 a drink. You can also expect to pay full price for authentic luxury goods, or big name electronics. Bangkok is known for high quality fakes if that's up your alley, but just expect to pay normal US prices for the real stuff. Both countries rely heavily on tourism, and if you're not careful, it's easy to be swayed by Tuk Tuk drivers into checking their "sponsor" stores. At times, it can feel as if everyone in Southeast Asia is trying to sell you something. Both countries, and I'm guessing most of Southeast Asia, are big on night markets. It's essentially a Southeast Asian version of NOLA's Bourbon St., or Austin's Dirty 6. The night markets are lined with street vendors, bars, restaurants, massage pop-ups, and the mildly disturbing fish pedicure stands. Street vendors sell everything from chintzy trinkets to fried insects. Sky Bar: Located in Bangkok, with amazing views of the city. Be prepared to pay top dollar for drinks here. Grand Palace: This is one of the largest wats (temples) in Bangkok. Be prepared for huge crowds, and be sure to dress appropriately. Amphawa Floating Market: While it has become quite touristy, if you're going to see a floating market you might as well visit the original one. Elephant Nature Park: While your in Chiang Mai, pay this place a visit. 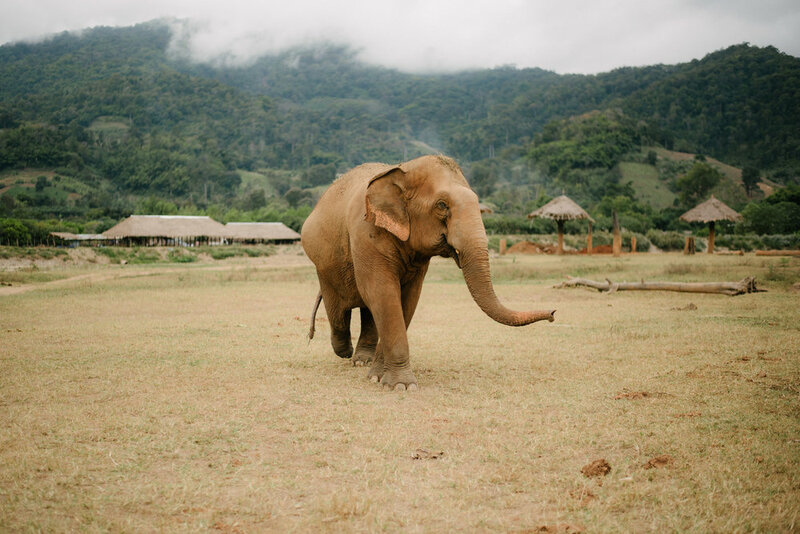 The Elephant Nature Park rescues and cares for abused/injured elephants, and is definitely worth the visit. Angkor Wat and Angkor Thom: Take a flight to Cambodia and visit these amazing historical sites. Pub Street: Come here after a long day of wat tours.